Not all warriors on the medieval field of battle were knights clad in plate armor. In fact, not all warriors even preferred plate armor. Some, like the foot soldiers, used something more closely related to this Riveted Leather Brigandine Armor. Also known as a coat of plates, this style of armor merged the protective potential of plate armor with a more lighter and comfortable style leather armor, offering a warrior a good mix of protection, comfort, and maneuverability. This recreation is crafted entirely from fine leather, with a stitched interior and exterior shell. Set within the leather are steel plates, which are then riveted into place, with the rivets being visible on the exterior shell. The armor features wide arm openings, to ensure a good range of movement, as well as buckled straps on the sides and shoulders, for securing the armor in place. It extends just slightly past the waist as well. It is offered in one size, but that size is a generous one that fits most with ease. 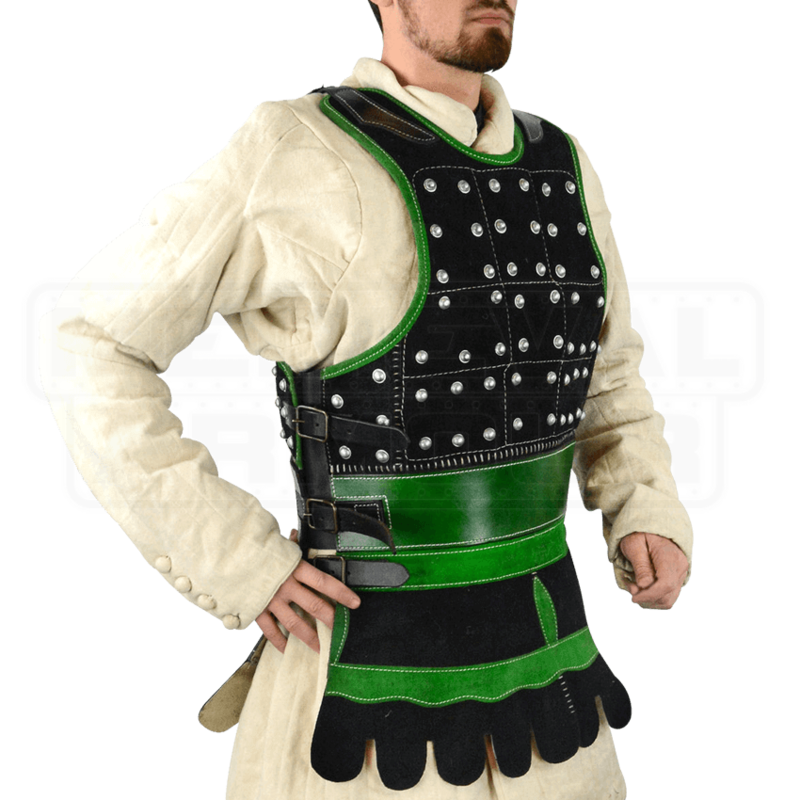 Combined with a gambeson and mail (as it was traditionally), this Riveted Leather Brigandine Armor is a solid choice for foot soldiers and knights to wear into combat. And even with just this armor alone, it makes for fine protection for adventurers, rogues, and more, as well as good protection for a LARP fight, too. One size fits most. Fits up to a 48 Inch Chest and a 37 Inch Waist.